Jun 09, 2018 in "Guardians of the Galaxy - Awesome Mix Live!" Guardians of the Galaxy Awesome Mix Live! made its debut today at Epcot's America Gardens Theater. 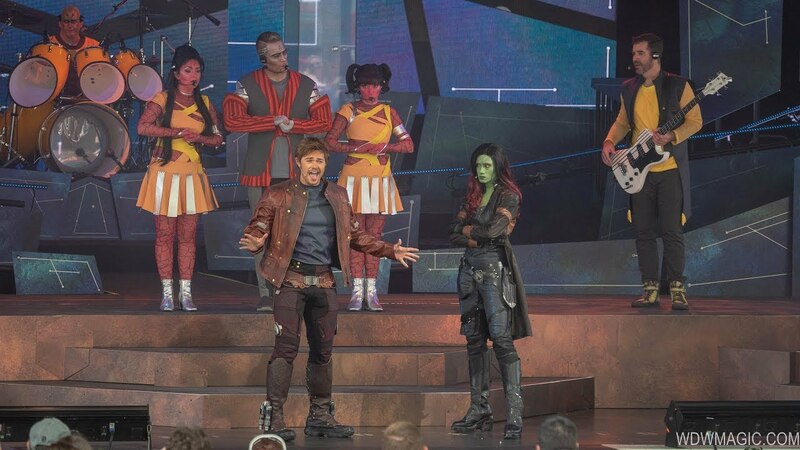 The show features Star-Lord and Gamora in person as a 7-piece alien band brings many of your favorite hits from Awesome Mix Volumes 1 & 2 to life. Showtimes are at 1:30pm, 2:30pm, 5:30pm, 6:45pm and 8pm daily through August 19 2018. Here is a look at the very first performance of Guardians of the Galaxy Awesome Mix Live! After saving their world from certain destruction, Peter Quill—a.k.a. Star Lord—brokered a deal with Nova Prime and the Xandarian government to bring an outreach program to his home planet. The purpose? To share Xandar’s rich heritage and culture with Earth’s people. As luck would have it, Peter informed Xandar’s leaders that there’s already a place on Earth with a similar mission… a theme park called Epcot, where all of Earth’s cultures are celebrated. So, as part of their first outreach, Xandar has sent some of their most talented performers to showcase their music! Click the gallery for pictures of Guardians of the galaxy Awesome Mix Live! More from "Guardians of the Galaxy - Awesome Mix Live!"